Modifying a car and developing it are two completely different animals. Here is a story about the later. 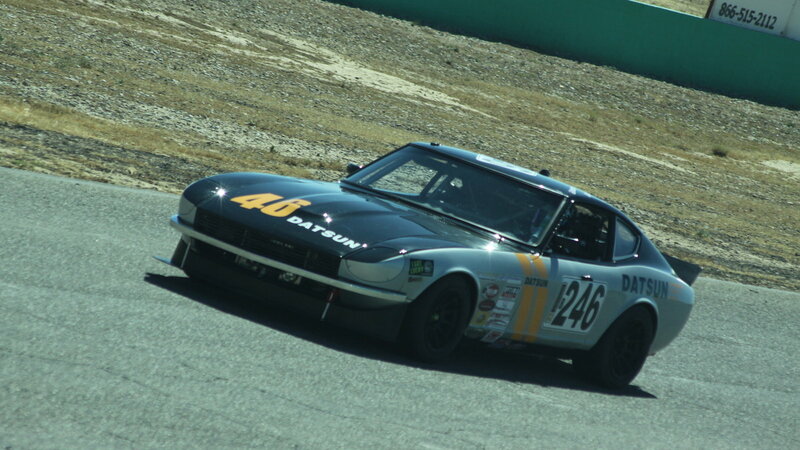 Meet the team: the UFR Datsun 240Z. Spiritual kin to the S2000 this front engine rear wheel drive platform was the automotive equivalent of an S2k during its time. 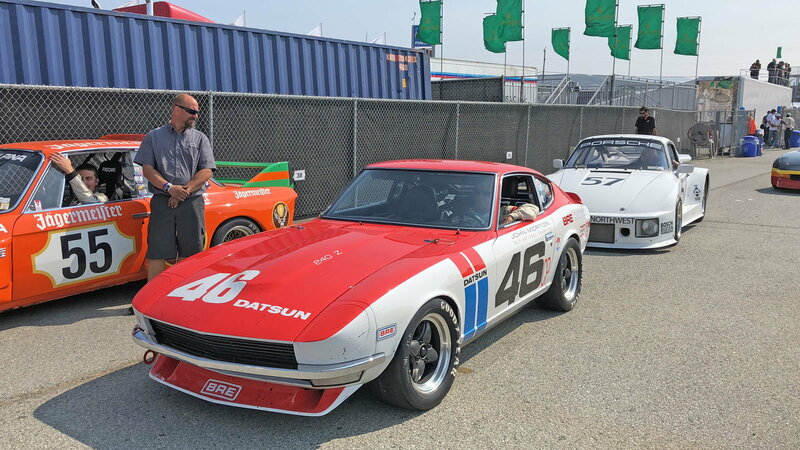 John Morton who has won an SCCA championship in the famous BRE 240Z car and Steve O’Hara who has Formula Mazda and Atlantic wins to his name were both on deck to walk me through a proper testing session. This is how the pros do it. Oh yeah, Ayrton Senna’s former race engineer was also there to give me some advice: Steve Nichols. PRO TIP: Your team is everything. Linking up with guys who have decades of experience is one of the best ways to take a short cut towards getting faster. Learn from the best and your driving will get better whether you realize it or not. The gentleman who was kind enough to let me test this car for free was an avid kart racer who has helped Steve build some single speed lay down enduros back in the day. These single speed machines made under 30 horsepower and were capable of clocking 1:18s…on the big track if you were brave enough to hold the throttle wide open for an entire lap. This team knows a lot about going fast so there was clearly a lot to observe. PRO TIP: Observation is a powerful tool at the race track. From watching other cars and listening to throttle inputs to seeing how top-level racers go about diagnosing a problem you can gain valuable insight just from using your eyes. >>Join the conversation about these changes to your suspension right here in S2Ki.com. When you know you will be driving with historical figures the first thing most people will think is, “I need to go fast to impress these guys and show them I’m competitive.” This is the wrong mentality to go into any kind of opportunity where you’re driving someone else’s car, yet you see this happen often. 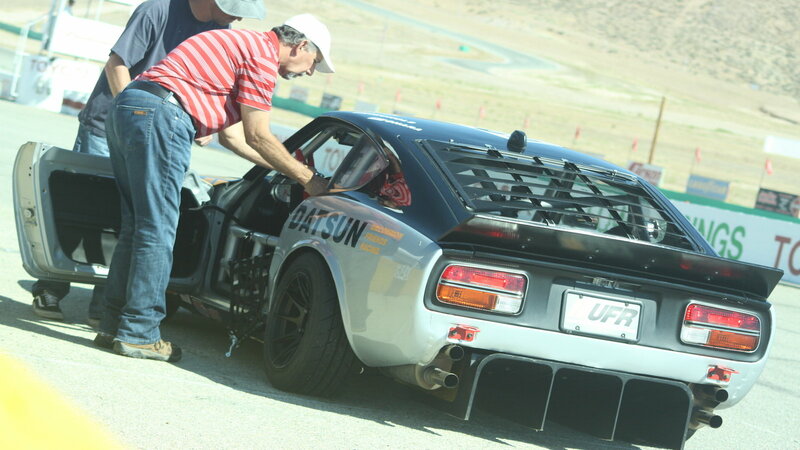 During a test of someone’s race car, the responsibility is to bring the car back in one piece with no damage. “Take it easy the first few laps, build up to speed slowly and radio in once the temperatures are up, then push,” is what the team owner left me with as I flipped my visor down and fired up the ignition after flipping over the master power switch and fuel pump. 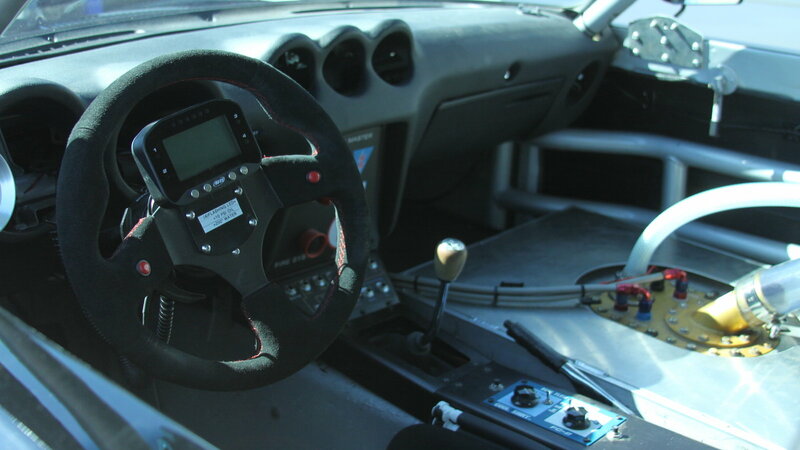 PRO TIP: Driving a race car successfully requires a calm even temperament. You need to treat driving the car the same way a fighter pilot flies his plane. Look at your instruments and don’t let the red mist engulf you at any point. After confirming that all temperatures were up to spec I radioed in one last time before putting in 30 minutes of flying laps. “Pit this lap, pit this lap” was my confirmation to come in and that’s when I saw the difference between the pros and amateurs: 6 people immediately went to work the moment I came in. Everyone with a purpose. John asked me how the car was while O’Hara watched like a hawk to assess my every word. “It feels planted in turn 1 with a small amount of oversteer if I get on the power before the apex,” I said. They wanted a breakdown of the oversteer: was it happening on turn in at all? Was it abrupt or smooth? Did the car feel stable on the brakes over bumps? Everything was assessed and written down from tire temperatures to handling characteristics and track conditions. PRO TIP: Consider everything when you go out to do testing. Certain tracks stay cooler or warmer during parts of the year and this can seriously affect whatever lap time you are shooting for as well as your car settings. Keep records of everything so you can reference back to what worked on a similar day at that track. PRO TIP: Forget years, it takes decades to truly master setting up racing cars. Track conditions change, temperatures change and rules evolve. All of this lends a particularly unique challenge that you need experience to feel comfortable with. Have patience with your driving and understanding of modifications. It’s not easy. If there were any questions about a sway bar being changed to benefit in turns x, y and z these guys didn’t talk about it like some enthusiasts do, they just got under the car and made the necessary changes. Many racers get in the habit of subscribing to a particular tuning philosophy and will never deviate from that no matter what. This isn’t a healthy habit to get into because the only true thing that is constant at the race track is change. “I’ve been coming here since the late 50s,” Morton was quick to point out. “There used to be huge boulders in the runoff so you had to be really careful back then.” John is a reminder that even your driving style can change years later at the same race track. PRO TIP: Certain things like toe angle need to be approached with extreme caution, but altering your driving line or playing around with brake compounds should be part of the fun of figuring out what goes into being fast. Don’t get caught up in one person who posts fast times and their method of tuning. There are many things to learn in racing and a lot of different ideas out there. You just might be surprised what you find by trying things out that seem unconventional. After disconnecting the rear sway bar to see if I could feel that it was disconnected I had a massive spin on the outside of Turn 4. The car had pitched sideways on me and during mid-counter steer, the back end touched some big bumps on the outside of the corner. 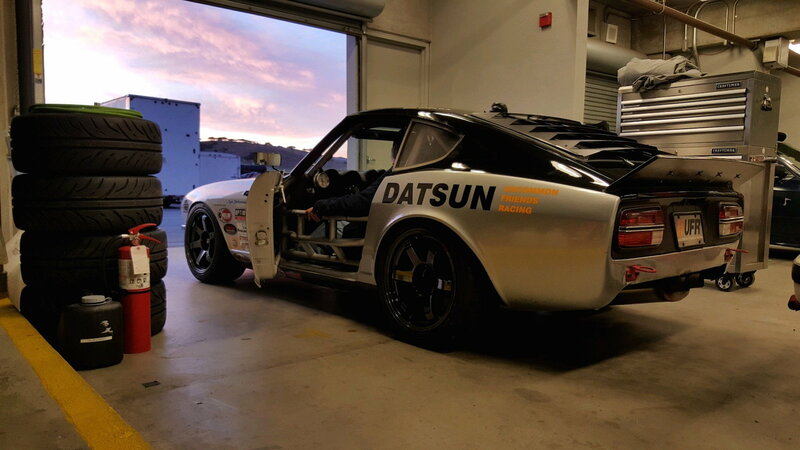 Terrified that I would have to sell my kidney to pay for the damage I eyeballed the best rut to tuck the beautiful Datsun into and backed it in on the brakes. “Well that looked like fun” was all I heard over the radio with a bit of laughter in the background. Something this subtle is true insight into the difference between these guys and most racers: even when things go wrong they don’t panic. It was actually explained to me that part of the reason was that they didn’t want me to get riled up and drive overly aggressive afterward. The final lesson and most important lesson I learned from these legends are to stay calm when things are going wrong. Never panic, always think rationally and logically—even when you're backward at 75mph headed for the gravel. PRO TIP: Don’t rile yourself up unless it’s necessary to make a pass. You want even calm nerves on the race track at all times. Smooth is fast and steady hands require steady breathing. Keep a level head and relax so you can feel what the car is doing at all times.